Gunnison Mayor Bruce Blackham points to a map where there may be proposed solar development on the outskirts of the city. Blackham will have 20 years as an elected official when his term ends in December. He has many accomplishments under his belt, and a few regrets, but he gives all credit for his contributions to the love and understanding of his wife. GUNNISON—Gunnison Mayor Bruce Blackham attributes his success in parallel careers as a utility company executive and elected public official to three things: sincerity, hard work and the love of a good woman. Blackham, who served two terms on the Sanpete County Commission and is completing his third term as mayor of Gunnison, says he will retire from public service when his current term as mayor ends in December. About the same time, he plans to retire as operations manager for the Richfield District of Rocky Mountain Power. Blackham grew up in Richfield, attended Richfield High, played baseball and served an LDS mission in Germany. He says his mission taught him some valuable lessons. “I really enjoyed the process of self improvement and sharing of values,” Blackham says of his time on mission. While in Germany, Blackham met a young man who was struggling with the values his family practiced. The young man was trying hard to hang on to his own values, values that were more selfless than those he had been raised around. With new life lessons fresh in mind, Blackham returned from his mission and reconnected with a high school acquaintance, Becky Crowley, whom he went on to marry. Blackham says he felt very positive about what life had in store for him and his new family. “The feeling was that life was a blank page and that I could write anything I wanted,” he says. 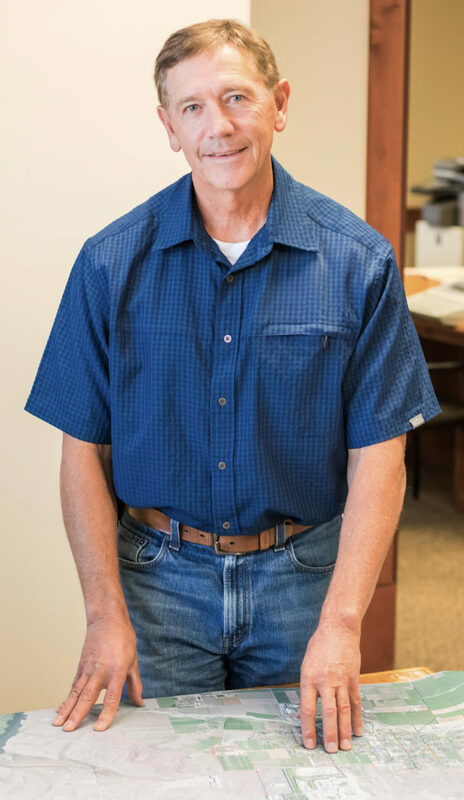 Blackham began a career with Utah Power and Light, which would change hands several times, ultimately becoming Rocky Mountain Power (RMP). Blackham climbed the ladder with the company over more than 40 years, maintaining his job with each buyout. His work brought a move for him and his family to Gunnison and eventually led to his final position as an operations manager. He says he got his feet wet with community participation by joining the Gunnison Jaycees, but his desire to be more directly involved in improving his community pushed him to run for office. In the mid 1980s, Blackham decided to run for mayor of Gunnison City. He ran against Richard Kjar and won. He believes his sincerity and willingness to work hard were the reasons he won. Before long, he heard the Utah Department of Corrections (DOC) was looking for a location for a second state prison. While most people in the state were averse to having the prison in their communities, Blackham saw an opportunity for the Gunnison Valley. He threw himself into the task of convincing the DOC that Gunnison was the right place for the new prison. But DOC officials weren’t the only people he had to convince. Local residents, too, were hesitant at first. “We held a lot of meetings and public hearings,” Blackham says. “There was plenty of opposition, but in the end we got it.” Blackham says the DOC’s choice of Gunnison was in part due to the sheer amount of work he and other officials did—first convincing the community it was a good call and then proving to the DOC that Gunnison City sincerely wanted the prison in its backyard. The economic boost the Gunnison Valley has received from having the Central Utah Correctional Facility (CUCF) built is well documented. And Blackham says the big win helped to confirm his feelings that he could make a positive impact through public office. He ran for a second term as mayor, which he also won. During that term, he worked to improving the community’s recreational resources such as the ball fields and the city park. After two terms as mayor, Blackham took a few years off from public office during which he focused on his professional career and his family. But after a while, he felt the urge to serve on a higher level. A seat as county commissioner was opening up, and he decided to run. He beat his opponent, Kim Pickett, running on the platforms of countywide economic improvement and getting tough on drug crime. One of the biggest tasks Blackham faced during his time as county commissioner was rewriting the county zoning ordinance, which was out-of-date and not meeting the needs of residents. “A lot of public complaints about it were coming up. It needed a total rewrite,” he says. That’s exactly what Blackham did. He made the reconstruction of the ordinance his baby, working late nights and trying to balance out every angle—and getting his wife’s opinion on many of the changes. Like the bid for the prison in Gunnison, getting the zoning ordinance approved was a lengthy process, requiring multiple drafts, public hearings and meetings of the commission. “In the end, almost everyone was satisfied with the outcome,” Blackham says. One of the next big tasks arose when county officials found the current jail, which was housed in the basement of the county courthouse, was no longer workable. It was old, small, not sufficiently secure and didn’t comply with federal regulations. The decision to build a large, modern jail began another lengthy process, which occupied the commission with public hearings, taxation hearings, planning, choosing the right location and choosing a contractor. Although home runs like the new zoning ordinance and new county jail stand out, Blackham, he has some regrets too. A proposed new courthouse, which was defeated in a referendum by six votes, despite the hard work that went into it, was another thing he wishes had fallen into place. Blackham says he wishes he had been able to better explain and convey the benefits of the plan to build the new courthouse. After his time as a Sanpete County commissioner, Blackham took a few years off before feeling the urge for public service again. He decided to go for one more run as Gunnison mayor, and, as before, he won. During this final term as mayor, Blackham has crusaded for a number of community causes. Alongside a group of like-minded Gunnison Valley leaders, he paved the way for the Gunnison and Centerfield law enforcement to unify into the Gunnison Valley Police Department. With the support of the council, he has been behind the wheel for other milestones, such as the restoration of the Gunnison Valley pool, installation of the new splash pad, city park improvements and expansion of the Central Utah Correctional Facility. He also pushed hard to clean up Main Street. Ironically, as a man who, by December, will have served five four-year terms as an elected official, he is supporting a proposal for term limits for Gunnison City elected officials. 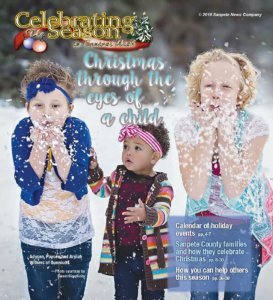 When asked how he managed to carve out a spot for himself as a pillar of the community through public service, succeed professionally in highly responsible position with Rocky Mountain Power, and to balance a family life with his wife Becky and their three children, Blackham gives 100 percent of the credit to his wife. After retirement from his mayoral professional duties, Blackham says he looks forward to more hiking with his family. 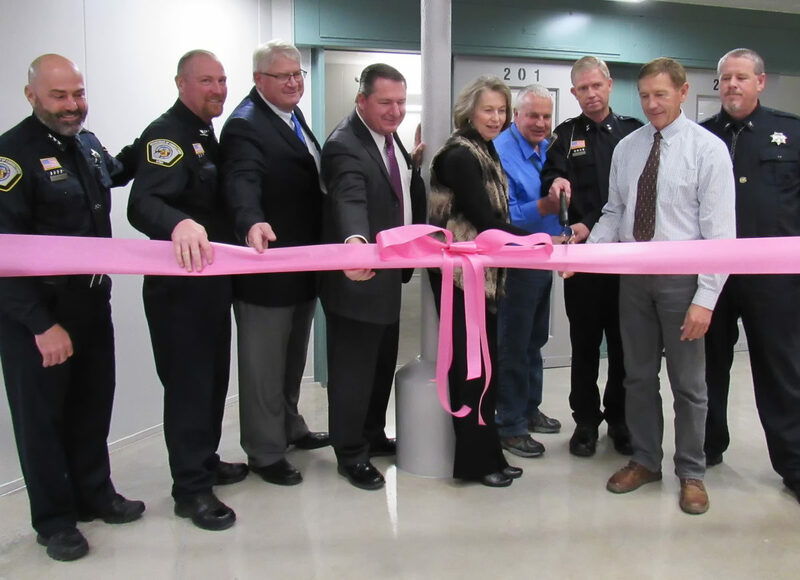 Gunnison Mayor Bruce Blackham (in white shirt and tie) participates in the ribbon-cutting for a 192-bed expansion at the Central Utah Correctional Facility, one of many community milestones in which he has had a role. The expansion created 75 jobs.